Enter the dimension of the item you'd like to fit inside the bag. Note: This will search for bags that are larger than the dimensions you enter. Width represents the opening side. Add extra space to the final dimensions - width and length of the bag for play. For the best fit we generally recommend adding 3/16" to the width and 1/16" to the length to provide the best balance of snug fit and ease of insertion. At a minimum, add 1/8" to the width to allow for enough room to insert the product. Add the depth (1/4") to the width (5")(opening side) = 5" + 1/4" = 5 1/4"
Add 3/16" for tolerance = 5 1/4" + 3/16" = 5 7/16"
7" + 1/8" (1/4"divided by 2 = 1/8") = 7 1/8"
Add 1/8" for tolerance = 7 1/8" + 1/8" = 7 1/4"
The final result gives you the minimum bag size required at 5 7/16" x 7 1/4". 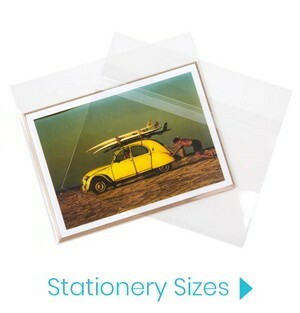 This would fit a 5" x 7" product with a backing board and mat (overall depth 1/4") fairly snug. Check your measurement against the list of bag sizes we offer. 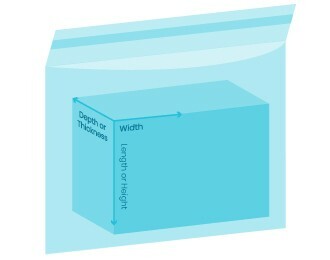 You will find we have a 5 7/16" x 7 1/4" bag to fit most 5" x 7" products. If you are having a hard time finding the exact size in stock you may consider using a standard flap seal Crystal Clear Bag with extra length to fit your product. 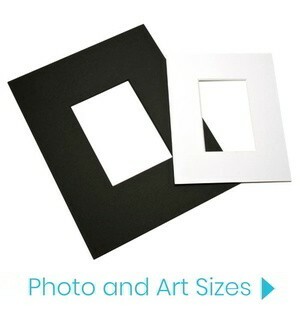 By using a flap seal style closure, you can fold the flap down as far as necessary to achieve a snug fit. For example, a 16" x 18" product 1/4" thick fits well into a 16 7/16" x 20 1/8" bag (B16) by simply folding the flap down 2 inches when you seal it.